When the officers of the 28th Infantry Division returned from Europe after World War I, they began holding reunions and dedicating shrines here on the original training grounds of Col. Theodore Boal's mounted machine gun troop. 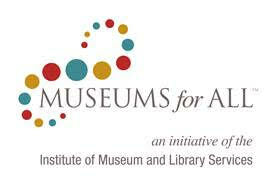 By the 1950s, the Pennsylvania Historical and Museum Commission operated the site. Now, generations after its incarnation as a modest WWI memorial, the 28th Infantry Division Shrine has blossomed as thousands of Division veterans have joined the ranks of their forebears. With our heritage and legacy being that of a training ground for soldiers that found themselves a part of the 28th Division, the Pennsylvania Historical & Museum Commission has entered into an agreed upon Standard Operation Procedure (SOP) with the Division Commander of the 28th. As such, we are unable to allow or support the placement of memorials or monuments to individuals; to view the 28th Division Monument SOP, click here. Click here for a printable brochure of the monuments and shrine. This monument remembers the 33 men of the Greater Wilkes-Barre 109th Field Artillery who lost their lives while en route to Camp Atterbury, Indiana. On September 11, 1950, the 109th’s train stopped along the tracks near Coshoton, Ohio while a broken air hose was being fixed. Without warning, a passenger train crashed into the rear of the train. Honors the 82 Marines, Soldiers, and Sailors from the 2nd Brigade Combat Team, 28th Inf. Div., who were killed in combat during Operation Iraqi Freedom from June 2005-2006. 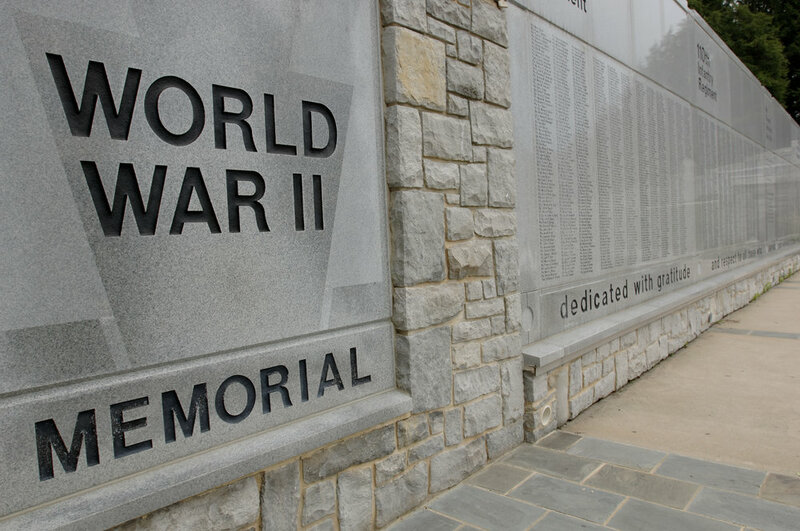 The memorial, constructed of granite & steel, is modeled after the original monument built by soldiers in Iraq that was disassembled and brought back to Fort Indiantown Gap. Inside, dog tags from each fallen warrior are suspended above a wind chime, creating a subtle sound whenever the wind passes. Dedicated to honor the men and women of the 28th Signal Battalion and the lineage organizations of the 103rd Field Signal Battalion and 28th Signal Company. All have served since 1908. Commemorates the 28th Inf. Div.’s soldiers of the Korean War Call-Up who served as part of NATO’s forces in Germany, as well as those deployed to Korea in 1951 as part of U.S. opposition to the Soviet Union’s involvement with the invasion of South Korea in the Cold War. Erected by members of the 28th Infantry Division in memory of their fallen comrades, this monument recognizes soldiers of the 28th Div. who gave their lives in the fight against the Global War on Terrorism. Honors members of the 28th Inf. Div. Band who assisted in the defense of Wiltz, Luxemburg, in 1944. This monument is a replica of a stone on solemn ground in Wiltz. 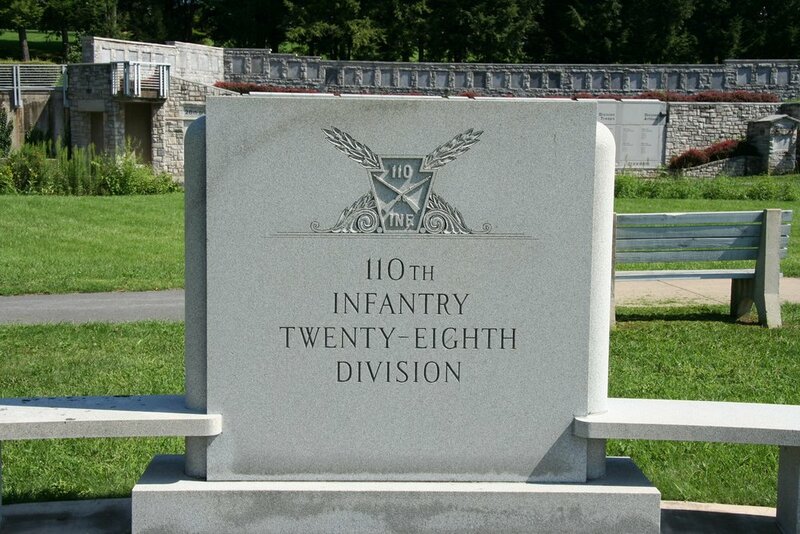 Commemorates those who served with the 109th Infantry Div. throughout its history, from the Washington Grays, a volunteer regiment formed in 1822, to WWII. Commemorates those who served with the 110th in WWI and II. Each bench is inscribed with the name of a battle that the 110th fought in during the World Wars. 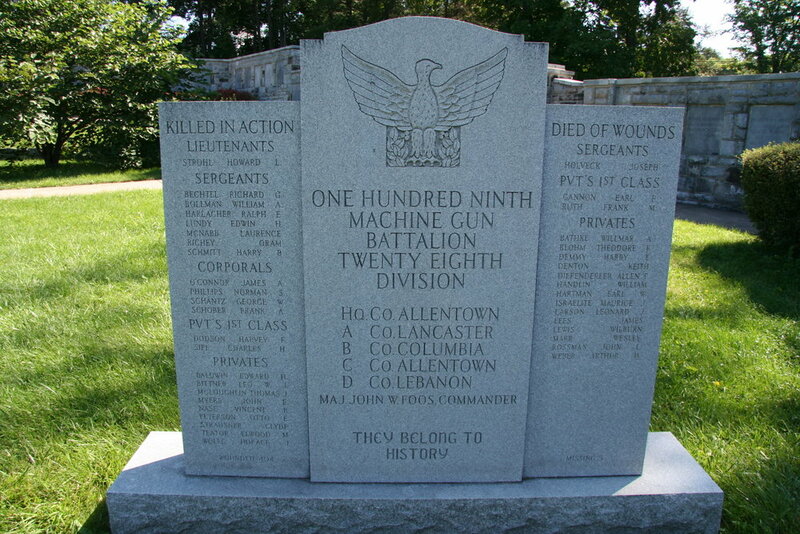 Erected by the Veterans Association of the 107th Field Artillery in memory of the “faithful sons of Pennsylvania who served this regiment”, this monument lists names of more than 2,400 men in the 107th in WWI. An artillery shell, placed atop the monument, represents perpetual light. The 111th Infantry, headquartered in Philadelphia, began as members of the "Associators", founded by Benjamin Franklin in 1747 during King George’s War. This memorial honors all who served from the Associators through WWII. 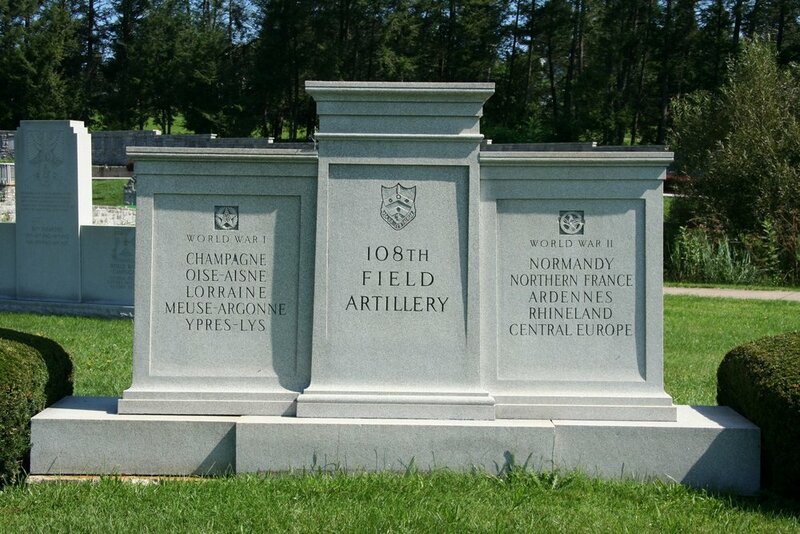 This recognizes the service of the 108th Field Artillery. The coat of arms of the 108th includes a diamond, circle, and maltese cross, all which indicate service in the Army of the Potomac. The keystone represents service in France during WWI. The lion is part of the coat of arms of Belgium, used here because of the regiment’s service as part of the 53rd Field Artillery Brigade under command of Albert, King of Belgium. The unit's motto means "Not Self, But Country". This unit served in the Civil War, Spanish-American War, Mexican Border Campaign, both World Wars and NATO. It was instrumental in stopping the final offensive of the German Army in WWI. Completed in 1956, the 112th was the last of the major units of WWI to dedicate a memorial. Fetzer, a battalion commander of the 110th Infantry Regiment, was killed instantly when Regimental Headquarters was blown up on July 28, 1918, near Fresnes, France. Fetzer was highly regarded, as it was recorded that “few soldiers have ever so favorably impressed the regiment in so short a time as Colonel Fetzer”. Erected by members of the 109th, this honors the enlisted dead of the 109th Field Artillery, commanded by Gen. Asher Miner, who served in WWI. 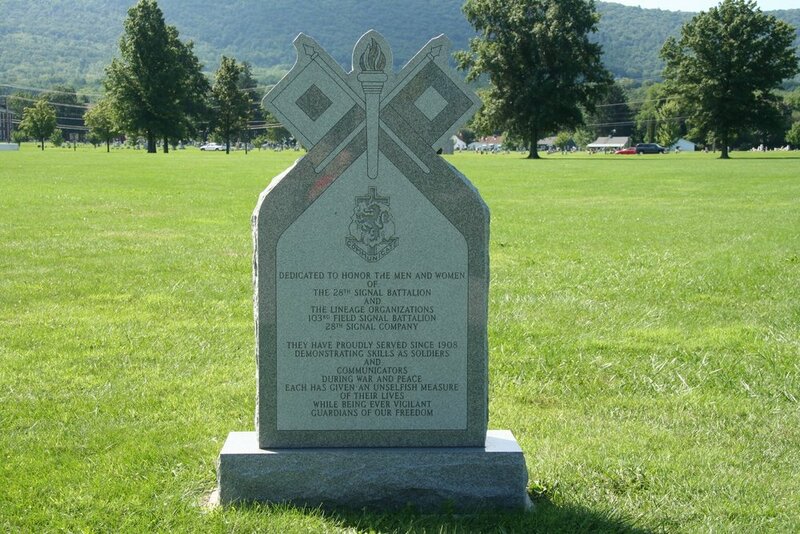 This memorial honors Gen. Asher Miner, who served in the 109th Field Artillery from Wilkes-Barre. On Oct. 4, 1918, Miner advanced his position behind infantry where he was heavily shelled. He received a severe wound that later necessitated the amputation of his leg. Asher received the Distinguished Service Cross and Distinguished Service Medal, and after WWI, he was made Brigadier General as commander of the 53rd Artillery Brigade. He retired from service as a Major General and died Sept. 2, 1924. Sigerfoos commanded the 28th Div’s 56th Brigade for 1 hour when he was killed in Montblainville, France. He was the only general officer to be killed in combat in France. Atop the monument is the wayside cross near which Sigerfoos died, a gift from the citizens of Montblainville. Major Anderson, Spanish-American war veteran and leader of the 110th Inf., was killed on Sept. 5, 1918 while leading a charge against a German machine gun nest. He received a Regimental citation and Distinguished Service Cross. 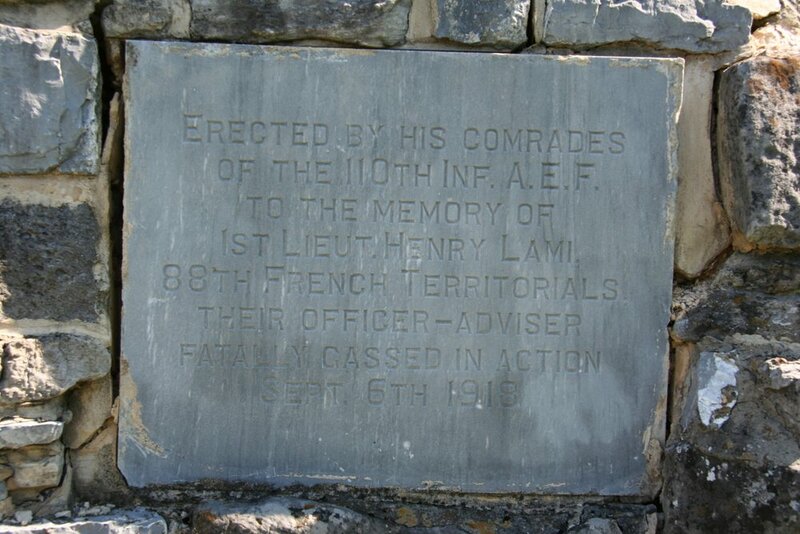 Lt. Lami served as a French Liaison Officer and interpreter within the 110th Infantry. On Sept. 6, 1918, he was gassed in action during the taking of Baslieux. He died after refusing to retreat, suffering the heaviest poison attack ever endured by the 110th. The monument was donated by veterans of the 110th Infantry. The insignia of the 103rd traces the unit’s history from its organization in 1916. Their first service, the Mexican Border Campaign, is represented by the cactus. The chevron represents the Vesle River, while the broken wheel represents the 10 ambulances disabled while crossing the bridge over the Vesle. The bomb burst commemorates the bombing of the 112th Field Hospital in France. 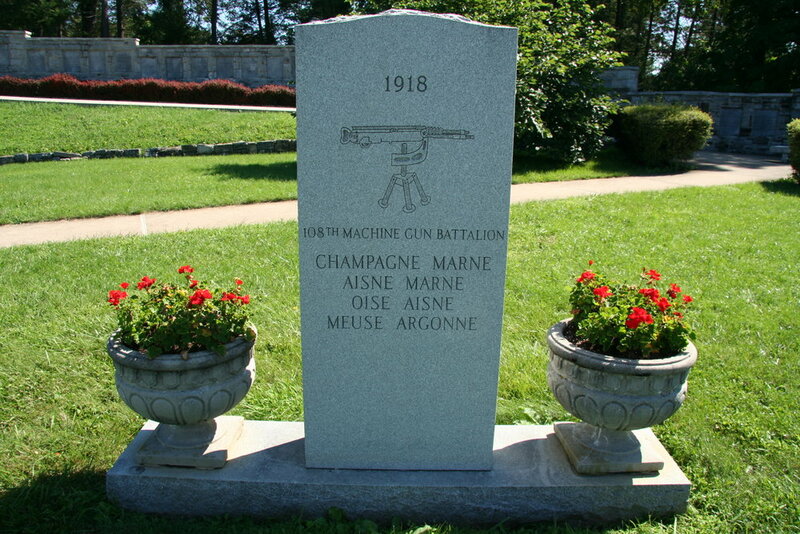 This monument honors the services of the 108th during WWI, whose campaigns included Champagne Marne, Aisne Marne, Oise Aisne, and Meuse Argonne. This monument, funded by 109th veterans, lists names of the deceased of the 109th, including companies from Lancaster, Columbia, and Allentown. The 109th suffered heavy losses, particularly at Vesle, France, where 125 men were wounded, 12 killed, and 28 gassed. At Death Valley and Fismes, France, Company C reduced from 175 men to 83, necessitating a reorganization with men added from every state in the Union. A memorial to Col. Boal, leader of the “Boal Troop”, member of the 28th, and original owner of land for creation of the officer’s club and shrine. When the wall of the shrine was built, veterans of the 28th left space for a shrine to Boal in the center of the wall for after his death in 1938. This wall celebrates the services of 28th Div. officers who died in WWI. The wall’s plaques are organized to represent the general positions of various units during the Battle of the Vesle River, represented by Spring Creek. This wall commemorates the 28th Div. soldiers who were killed or died of wounds received during combat in WWII. All units shown (except the 111th that fought in the Pacific) served in Europe from July 1944 to the war's end. This monument, honoring the collective service of 28th Div. members and all Pennsylvanians, was donated by Edward C. Stegmaier, the National Commander of the Society of the 28th Div. in 1953. In memoriam of the men who served in the 112th in WWI, whose campaigns included Champagne, Champagne-Marne, Aisne-Marne, Oise-Aisne, Lorraine, and Meuse Argonne. Based in Sunbury, PA, the Headquarters Troop served in WWI and acted in most of the 28th Div. 's major actions. This monument honors the service of the 103rd in WWI by representing one of a military engineer's most basic tasks: providing water.